Do you feel like your work is out of alignment with your true identity? 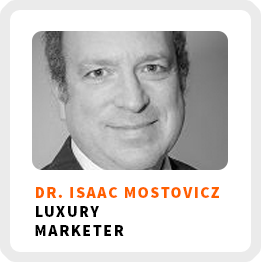 Isaac Mostovicz wants to inspire you to transform your work around your true identity by helping you understand who you are, what you do and the gap between the two. He is the founder of Janus Thinking, a consultancy that helps organizations focus on the well being of their customers and not just their bottom line. He spent 35 years in luxury marketing working in the diamond industry. After serving as the CEO of S. Muller & Sons, a well-known diamond manufacturer based in Belgium for many years, he left to start his first business helping retail jewelers engage their customers more effectively. What we can about motivation and self-actualization from luxury marketing. Why he believes people keep working for bad bosses. Why you are capable of learning new things on your own if you want to make a change in your life. Learn about yourself by reflecting on your past reactions to events you have experienced or write down your story. Core work activities + habits: 1) Practicing in different areas of life to apply and test his ideas. 2) Reading and talking with others to learn more. 3) Creating content and communicating his ideas with people. Self-reflection practice: Isaac has his clients write out their own story in order to see it from a different perspective and remove some of the emotions that may be clouding the story. 1) Be courageous. Get very clear on what it is you want to do moving forward and what you are willing to suffer for. 2) Identify a focused goal. Like reaching the summit of a mountain, hone in on exactly what it is you want to do. Use that as a first step to create a path toward your goal.